Go Jimmy Go pose for a picture before a concert at the Hawaiian Hut last year. From left are Eric White (sax, manager), Shon Gregory (drums, vocals), Jason "Bison"Friedmann (lead singer), Fernando Pacheco (trombone), Cameron Wright (bass) and Ian Ashly (guitar/ vocals). 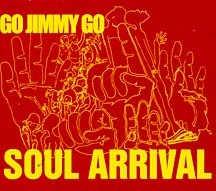 As Hawaii's premiere ska-reggae-soul band prepares to hit the road on the first leg of the Vans Warped summer tour, Go Jimmy Go's many fans will have to make do with their new CD to get their regular GJG fix while the band's away on the mainland, traveling from Idaho to California. Ably co-produced by the band and Mike Spengler, "Soul Arrival" is an apt title for the band's most accomplished and confident album to date. 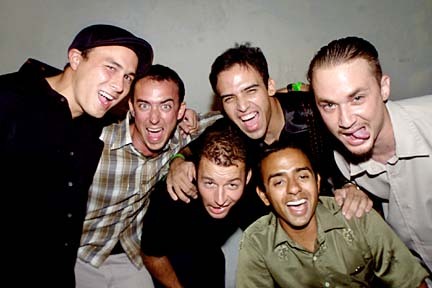 Go Jimmy Go has actually evolved from their earlier ska- and reggae-based sound to become our own version of a jumpin' little soul revue band, complete with its own star front man in James "Bison" Friedmann, whom the ladies love for his easygoing demeanor and hurts-so-good looks. That motivatin' groove can be heard on the songs "Push Me Out," with its smooth horn line and Beck-like goofiness, the New Orleans funk of "Takin' It Off," a highlight of the album featuring Bison's best vocal, and their single "In-Between Times," with a little nod of the head to King Floyd's soul classic "Groove Me." The latter song always gets the group's audiences going, as well as other such fan faves on the album as the testifying "Good to You" and the infectious "Slow Time," which ends the album on a sweet, hang-loose note with some nice group singing, with guitarist Tino Olsen taking a rare lead vocal. Go Jimmy Go also does new versions of some earlier material they recorded in the past. It's all for the better, particularly their take on "Mama Bird." The entire band -- Bison, Olsen, bassist Cam Wright, guitarist Ian Ashley, the duo horns of Fernando Pacheco and Eric White, and drummer Shon Gregory -- just click together on this light, appealing song. "Bang the Skillet," with a fine trombone solo by Pacheco, and the locally flavored "No Grumble" are the other two updates. There are also some noted contributions from special guests. Karina Denike, one-half of the powerhouse female vocal duo of Dance Hall Crashers, adds a welcome womanly perspective as she chimes in on "Pretending." Veteran session and Third Degree keyboardist Bailey Matsuda brings the funky flava of the clavinet to the skankin' "Undercover Brother." And the guys acknowledge the roots of their sound as well, with "Bit o' Soul's" acoustic, rootsy groove, combining the Nyabinghi drumming and reggae dub of Jamaica. The strength of "Soul Arrival" is such that it's worthy of the success outside the islands. It may not be as overtly Hawaiian a musical export as slack-key guitar, the Brothers Caz, Keali'i or IZ, but the talents of Go Jimmy Go now merit whatever accolades they hope to garner while on tour. Here's wishing them success! When: Doors open at 10 p.m.